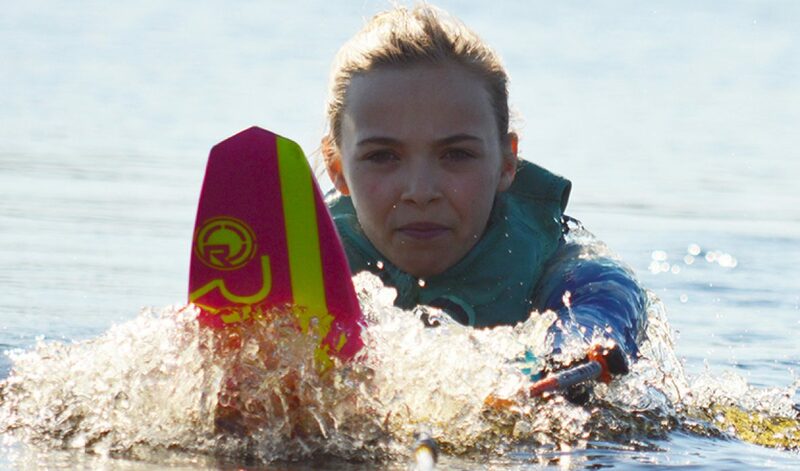 Water skiing isn’t just about the training. There are competitions throughout the summer and autumn. Its tough out there on the slalom course – one tiny mistake, missing the gate buoys (or even just going over them), means you’re out! When doing a Trick run if you fall, you aren’t allowed to ‘get back up’ and keep going. The run is finished. And that’s the end of getting any more points. Competitions don’t always go the way I hope…or want. But that’s part of doing a sport. Learning from mistakes, and getting back up there and trying again. Sure the photo’s are all of when I’ve done well…but there were plenty of times when I wasn’t smiling. This is the layout of a Slalom Course – You have to go through the gates, and get around all six buoys to have ‘run the course’. As you build up speed, and shorten the rope you use your scores reflect the number of buoys you’ve skied around so: 1@16meters means 1 buoy with a rope length of 16 meters with the boat travelling at the maximum speed for women of 55kph. If there is a speed in the score then that’s because the skier is starting at a lower speed – like 49kph. When you train, and compete you start at a speed you know you can run, and build up the speed, and shorten the rope until you’re skiing at your maximum possible. For me, last year I started at 49kpm, and ran the course until I shortened at 14m. Amazing Skiing at Worlds Jodi! I Made The British Team U14!